Our most popular business card holder! 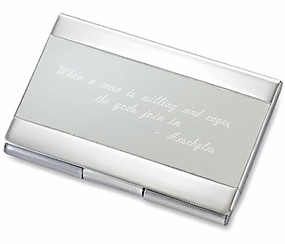 This business card holder has a two tone design of satin and high polish silver finish. It's beauty lies in its simplicity with plenty of room for engraving in the center with a name and/or business title. This case can comfortably hold up to 15 business cards or up to 6 credit cards.